When assisting the driver exit the parking space is completed the above message will appear. 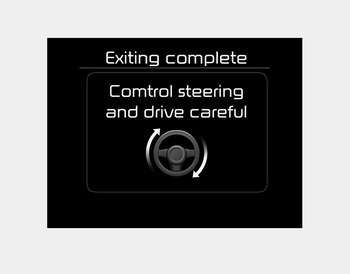 Turn the steering wheel to the direction you are leaving and manually control the steering wheel while leaving the parking space. When leaving the parking space turn the steering wheel as much as you can to the direction you are leaving, and then drive the vehicle slowly by depressing the vehicle. Always check the surrounding before driving your vehicle if the Parking Assist System warning sound is continuously heard. The system will be cancelled for safety reasons if the vehicle is parked at a small space near a wall.